We'll celebrate spring with traditional dances weaving ribbons around a Maypole! Then we'll enjoy a potluck supper featuring fresh-baked pizza from the community bread oven. Following the potluck, we'll kick up our heels with some great contra and square dances. Pizza $1 per person, and please bring some pizza toppings or a side dish to share. Greenwich Town wide Garage Sale Weekend . May 18 & 19, 2019. Self guided, there are no maps. Come look for the sale signs and find some treasures. 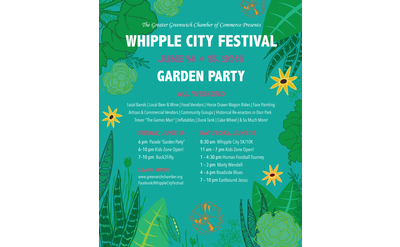 Join us for this much loved 27th Annual Whipple City Festival celebrating our town. This year's theme is "A Garden Party" -plant a seed, grow a village. The festival kicks off Friday night at 6:00 pm. There is music and activites in Mowry Park. Saturday is a line up of great music, activities, foosball tournament.